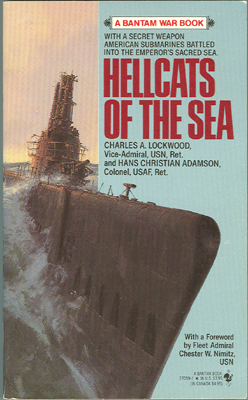 “HELLCATS Of The SEA” By Vice Admiral Charles A. Lockwood, Jr., USN (Ret.) and Colonel Hans Christian Adamson, USAF (Ret.). Foreword by Fleet Admiral Chester W. Nimitz, USN. Until sunset on June 9, 1945, the Sea of Japan had been Emperor Hirohito’s private ocean. For all practical purposes, World War II had never yet reached the Sea of Japan. On that day, all hell broke loose. The torpedoes of American submarines suddenly appeared on all sides. The subs fired scores of fish into dozens of Japanese freighters––shelled cargo sampans and fishing vessels, paralyzed maritime operations between Japan and Korea, and dealt a shattering blow to Japan’s will to fight. In a top-secret mission named “Operation Barney,” Admiral Charles Lockwood (ComSubPac) sent nine American Fleet Submarines on this daring and perilous patrol into the Sea of Japan. Each boat was equipped with a brand-new secret electronic weapon designed to detect enemy mines. A formidable wolf pack of competent submarine sailors––but only the sub officers knew the plans for Operation Barney. For 15 days the U.S. submarines had a hell-raising in the Sea of Japan, sinking 28 Japanese ships totaling some 70,000 tons. Sadly one of the boats, USS Bonefish (SS-223) was lost during this patrol. Here in “Hellcats of the Sea” is the compete story of Operation Barney, from its early planning stages to its end, when the last of the American boats exited the Sea of Japan. Authors Charles Lockwood and Hans Adamson turn out another exciting, true story on American submarine action in World War II. 1988 Paperback, 269 pages, with many illustrations. 2 maps, a crew roster for each submarine but no photos or index. Long out of print and now difficult to find.